I own a queen comforter and just change the duvet every season. I have a bird motif for the spring and a blue/white ticking stripe for the summer, but the plaid flannel is my favorite so I keep it from late fall through winter. Every year I post a photo of my bedroom and receive many questions of where things are from so I decided to link everything below for easy access. Monogram Decal – Oxford design, center letter is 22″ high and outside letters are 12″. 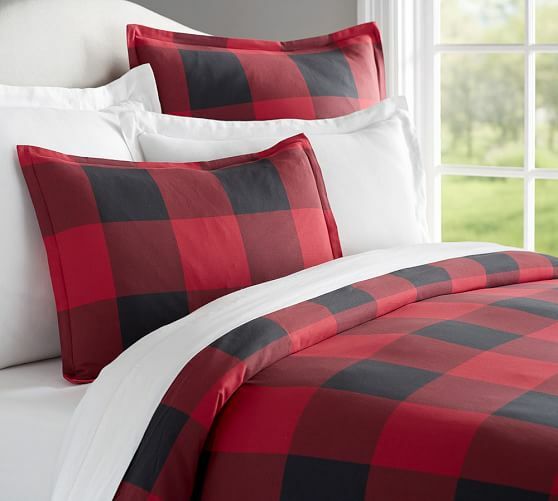 Duvet Cover – Similar style from LL Bean. Same colors, small plaid. My duvet is LL Bean but the style is no longer carried. Sheets (not pictured): Ultrasoft Flannel c/o LL Bean, review coming soon. These are the warmest! I also love their plaid version here. 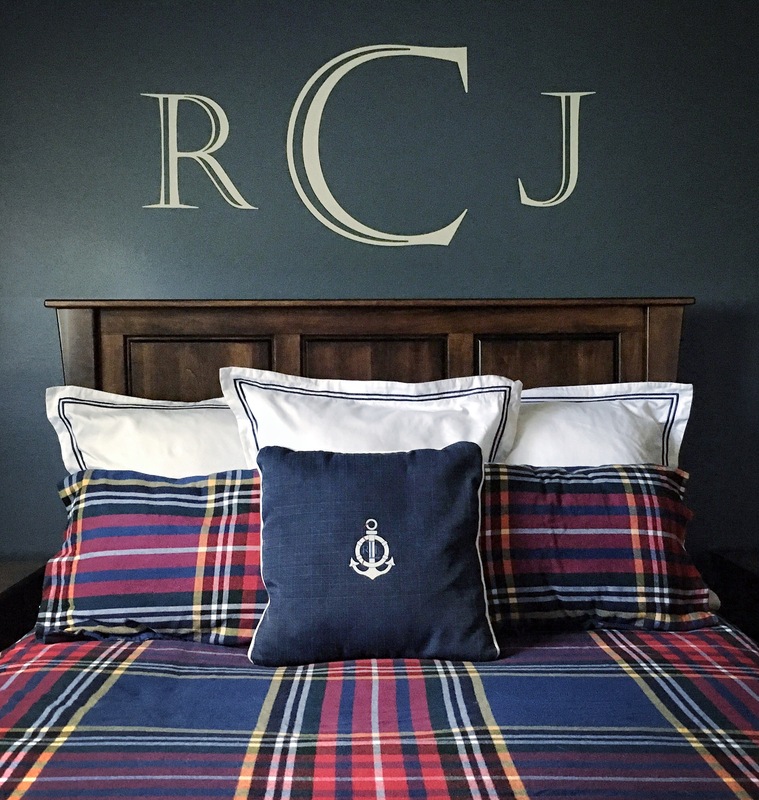 Navy Anchor Pillow: Ralph Lauren find at Marshall’s. Bed – Triple Raised Panel made of solid brown maple in coffee stain. Made by the Amish in Ohio, so there is no link online available. 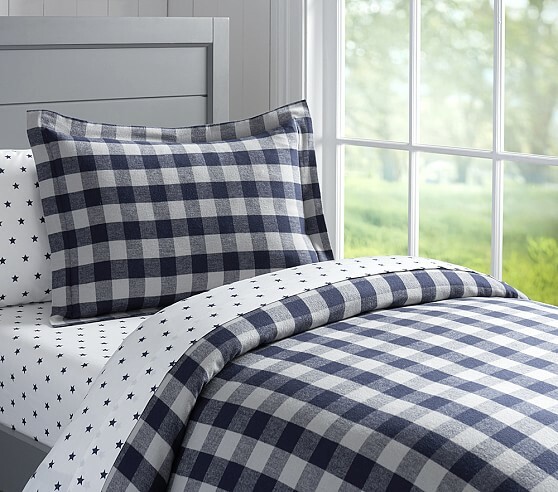 I found this Pottery Barn duvet similar to the photo above. I’m tempted to get it, but I think it looks best if you have colored walls and not a dark navy like mine. 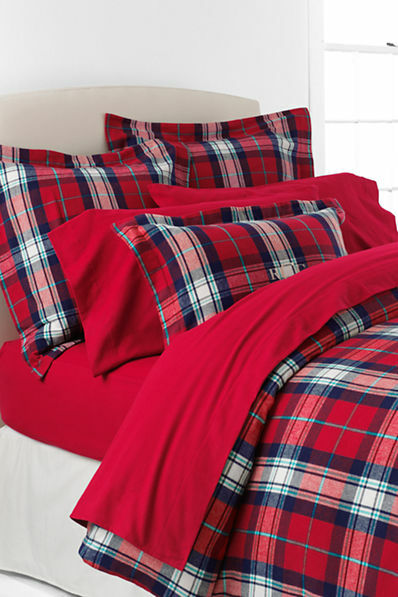 This Pottery Barn Duvet below is beautiful as well!